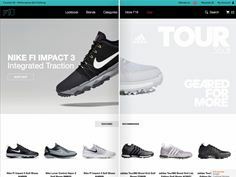 Function18.com, which sells golf clothing from top sports brands such as Nike and Adidas, has seen an 18% increase in average order values while doubling page views and time-on-site with new AI-powered personalisation technology from Nosto. The newly launched technology can automatically personalise every element on a retail site from the navigation bar, banners, videos and Call To Actions (CTAs), to logos – for both desktop and mobile – in real-time. A press release about Nosto’s new Onsite Content Personalisation and Segmentation & Insights can be viewed here: http://www.nosto.com/news-press/press-releases/leading-ai-powered-ecommerce-personalization-platform-nosto-launches-new-content-personalization-segmentation-tools-and-insights/. Function18.com is a specialist golf apparel store, selling products from the biggest global sports brands. The business was launched ten years ago by two young golf retailers who knew nothing about ecommerce. They set off with the goal of selling a few garments to support their “bricks and mortar” shop revenue but are now a force to be reckoned with in the worldwide golf market. Nosto is the fastest growing ecommerce personalisation and retail AI platform in the world. Supporting more than 2,500 retail brands in more than 100 countries, Nosto has fueled over 25 billion personalised experiences and delivered a gross merchandise volume (GMV) of more than $10 billion through its customer stores. Nosto’s end-to-end personalisation platform provides deep customer insights that drive real-time personalised shopping experiences across any touch point and any device. Through its patented technology, proprietary machine learning algorithms, vast network of ecommerce data and dedicated customer success team, Nosto supports its retailers from its offices in New York, Los Angeles, London, Berlin, Paris, Stockholm and Helsinki. More information can be found at http://www.nosto.com/.